Today I am canning peach salsa and stewed tomatoes. As I laid out the ingredients I stared at the onions in the netted bag and pondered the question "how do I keep from crying when cutting onions". If it weren't painful, I wouldn't mind so much. So of course I set out into the world of the WWW and found a few things out about cutting onions and ways to stop the dreaded painful tears from falling. "Unless you're a chef with a freshly broken heart, the tears you shed when chopping onions aren't emotional ones. That leaves two other categories of tears: basal and reflexive. Since basal tears are the ones that hang around our eyes and eyelids to act as a lubricant, that leaves us with reflex tears. The lachrymal glands above the eyelids regulate the release of tears. In the case of reflex crying, an external irritant, such as dust or smoke, triggers nerve endings in the cornea to communicate with the brain stem. The brain registers the irritation in the eye then alerts the lachrymal gland to stimulate tear production to flush away the invader. If we're chopping onions a few feet away from our eyes, what's causing this weepy reaction? The answer begins in the soil. 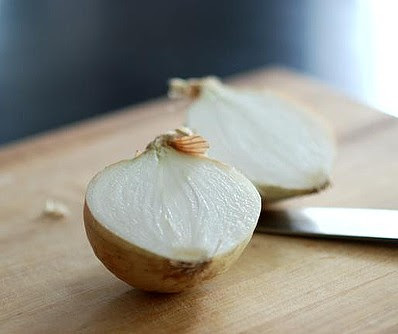 Onions are part of the plant genus Allium, along with garlic, chives, leeks and about 400 other cousins. These vegetables absorb sulfur in the earth, which helps form a class of volatile organic molecules called amino acid sulfoxides. These sulfoxides are the real tear-jerkers when onions go under the knife"
So to answer the question at hand I did some more research. I've heard of and tried all sorts of different approaches such as breathing through your mouth with 2 carrots stuck up your nose which is not only unattractive but ineffective! There are suggestions to light a votive and to cut the onion under water - both of which do not solve the problem. You can dip the cut side in vinegar which will remove some of the acid, but will also change the flavor. Then there's the suggestion to wear goggles which something I had not tried yet. So I will tell you the secret to cutting onions and not crying. Protect your eyes! I donned a pair of swimming goggles and went at it. I breathed normally and even at the end of my cutting I took a big ole whiff of the bowl of cut onions. I chopped 9 large onions and shed not one tear! I suggest cutting the onions away from a hot stove to avoid steaming up your goggles.